So fellow travelers, it’s time to send in the clowns. As I headed through the still dark and quiet streets at Columbus Circle, I heard someone call my name. 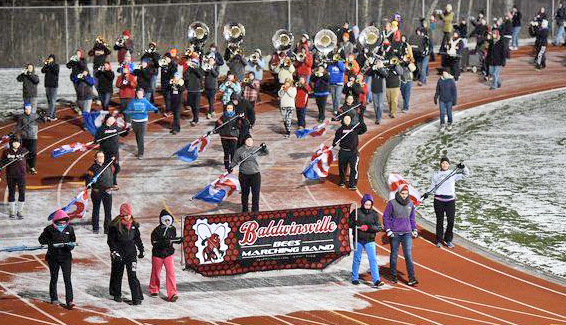 I turned to see fellow Baldwinsville Band Parents emerging from a nearby subway entrance. 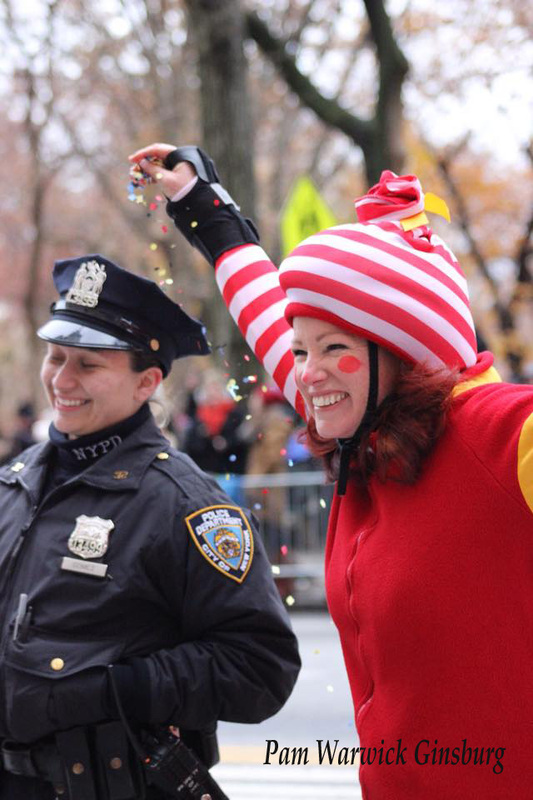 I quickly filled them in on the directions I had received from the NYPD officers and we agreed to find a location just north of the bleachers, where we could line up on both sides of the parade. Band parents learn how to strategically place themselves to be able to see their kids perform. For example, I knew our daughter would be on the left (if you faced the oncoming band) end of the bell line. Other parents had kids closer to the opposite side of the lines. We also knew from messages coming in on our phones that groups were meeting at various locations along 6th avenue. As people began to arrive and stake out spots along the curb, a sweet young NYPD officer who told us she was assigned to our block advised us to be sure to scoot out to “use the facilities” before the side streets were closed off. My husband decided to make a coffee run to Starbucks which was the closest “facility” available. While he was gone, we struck up a conversation with our officer. We told her our kids were in the parade and much like the NYPD officers who I met an hour earlier, she was genuinely excited for us. We could also her radio broadcasting reports on various protest groups moving through the streets of Manhattan. 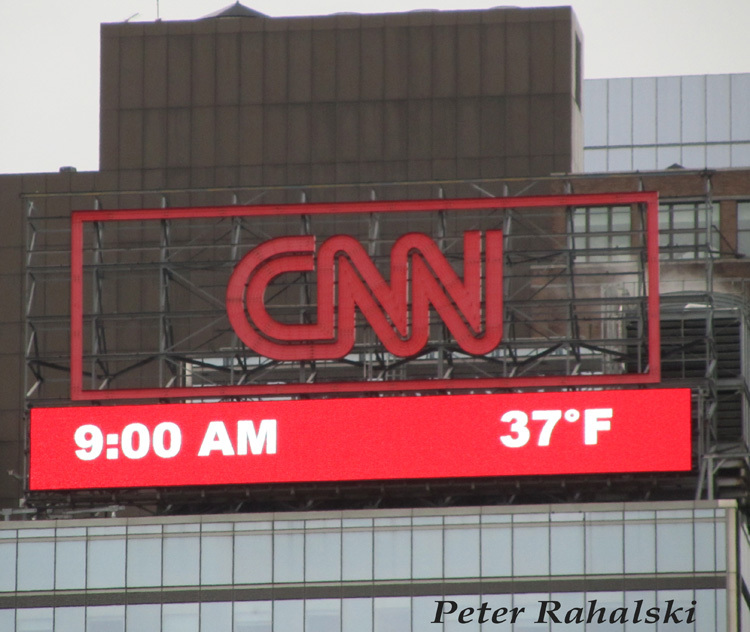 While the combination of protesters and the Nor’Easter had caused severe problems the day before for many people headed into and around the city, we knew from the band text messages that our group had not encountered any problems. One mom asked a bit anxiously if the protests would interfere with parade and our officer answered confidently “I doubt they will be able to get close enough. Your kids will all be safe.” I know every parent gathered with me at 62nd Street and CPWest would take a stand that violence on either side of the law solves nothing. But this was not the time or place for politics. The focus right now was on the kids and their performance. My husband returned and as he handed out the coffee orders explained the side street had just been closed off to pedestrians. It was about 6:45am, daylight beginning to reveal a slate grey sky…. 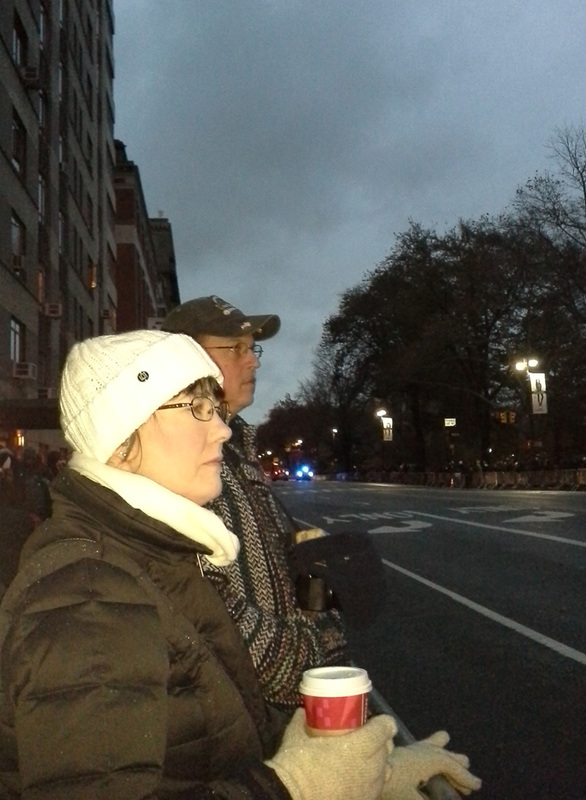 The parade is staged at the American Museum of Natural History between 79th and 81st streets. The night before we were able to see the famous balloons and now I had to admit I was almost as excited to see Snoopy as I was to have the band heading our way in about two hours. All we knew about the band’s location in the line up so far was their performance time at Herald Square would be 10:18am. (Not 10:15 or 10:20 mind you, precisely 10:18am and everyone watching at home knew to have their TV tuned on NBC which has exclusive broadcast rights for the Herald Square performances.) Given the parade route is about 3 miles from start to finish, we figured the band had to be fairly early in the line-up since it would take them just about an hour to march that distance. 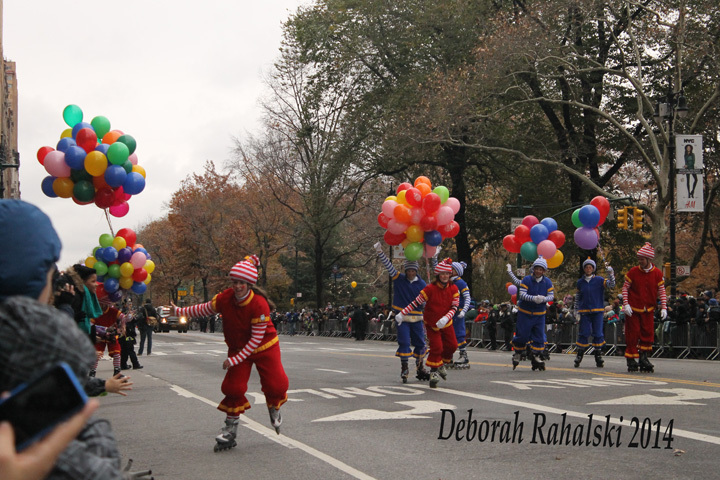 Remember the parade often has to slow down or pause as the massive balloons make the turns at the SW and SE corners of Central Park. Thankfully the wind was almost dead calm, perhaps having blown itself out during the blustery Nor’Easter the day before and cloudy as the morning dawned, we were grateful the air was dry, cold surely but good and dry. The kids had been training for over a year for this epic march. Its one thing for young legs to march three miles in cold weather. Its a whole different experience to march in step, carrying instruments, playing music in time and in tune for three miles. So to be sure these kids were ready they not only marched in the St. Patrick’s Day parade (known for hitting the coldest weekend in March almost every single year of its history) they practiced several times a week in November. One of the last rehearsals before the trip ran on a blustery near single digit lake effect sodden afternoon. Several kids said it had been so cold their instruments froze. I told them to take heart since the forecast was holding steady at temps in the 40’s and the threat of storms to pass through before parade day. The toughen up strategy worked; by the time the kids marched the actual distance of 2.7 miles that dry, windless mid 40 degree morning it was far easier than they expected. They weren’t excessively cold or tired and the marched and played like pros. Still for those of us standing still on concrete curbs it was a long wait as toes slowly froze inspite of multiple layers of socks. ( I had forgotten the crucial toe warmers darn it) We passed the time talking about the sights we had seen the day before, sharing funny stories about the hectic days before the trip trying to get kids packed and ready, showing each other selfies the kids posted. Suddenly everyone’s phones began pinging and singing. A message came through the group text: the band was behind the Wimpy Kid balloon, a new balloon in the line-up. (Diary of a Wimpy Kid is a series of popular kids books written by Jeff Kinney. They have a humorous appeal to elementary kids, especially boys.) Immediately texts were sent to those watching at home. 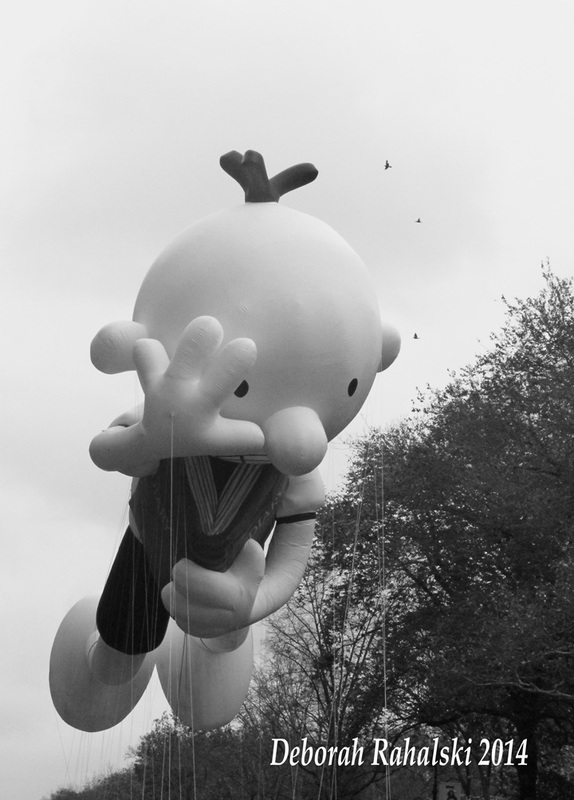 Keep a eye out for the Wimpy Kid Balloon, our anything but wimpy kids would be right behind him. 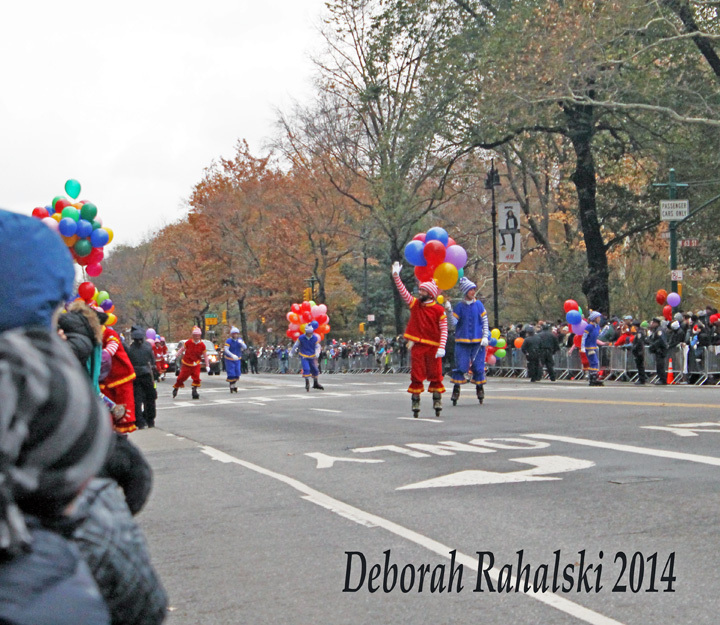 All eyes turned in anticipation up the street and in less than ten minutes the first heralds of the parade rolled towards us…..
Clowns on roller blades armed with massive pockets full of confetti…..
Oh the fun is just beginning.